The Department of Finance said each year its officials meet with representatives of all industries in the run up to the Budget. 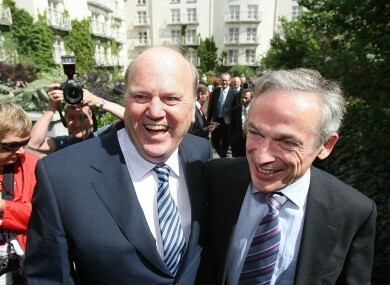 Minister for Finance Michael Noonan and Minister for Jobs, Enterprise and Innovation Richard Bruton. MEP NESSA CHILDERS has criticised two government departments for not disclosing meetings with the tobacco industry, which she said breaks the terms of a WHO treaty which Ireland has signed. In response to questions from TD Kevin Humphreys in the Dáil, both Finance Minister Michael Noonan and Minister for Jobs, Enterprise and Innovation Richard Bruton confirmed that officials from their departments had meet with industry representatives. Minister Noonan said his officials held meetings with representatives of John Player, Philip Morris International and the Irish Tobacco Manufacturers Advisory Committee (ITMAC) prior to the budget. In addition, one meeting took place between tobacco industry representatives and officials of the Revenue Commissioners in the period from 1 July 2012 to date, on matters concerning tobacco enforcement and control. Minister Bruton confirmed that his officials have met with Japan Tobacco International. “These meetings happened in the past few months and despite a warning from Health Minister James Reilly last May to his cabinet colleagues of their obligations under the WHO treaty,” Childers said. In the run up to the Budget each year officials from the Department of Finance meet with representatives from all industries who request such meetings, including representative from industries that pay high levels of taxation such as that the tobacco industry. These meetings are fully disclosed and all Pre-Budget submissions received are released in line with the Freedom of Information Acts. However Childers said this directive is a major priority for the Irish Presidency. “We know that the industry are lobbying specifically on tax and intellectual property grounds against the new EU law,” she added. She said it is important to be “vigilant against the massive negative industry lobbying campaign” that is trying to block and defeat anti-tobacco legislation. Email “MEP criticises two government departments over tobacco industry meetings”. Feedback on “MEP criticises two government departments over tobacco industry meetings”.